Linda Marie Roller, 60, of Billings, passed away with her family by her side on January 20, 2019 at the Billings Clinic. She was born January 16, 1959 to Carl and Mary (Hawkins) Reichert. Linda graduated from Senior High in 1979. After graduating she married the love of her life Dean Andrew Roller on July 21, of that same year. Since Dean was in the Marine Corps, Linda had to adjust to being a “military wife” which meant they had to move around. They lived in: Yuma, AZ, Bismarck, ND, El Toro, CA, Dallas, TX, Beaufort, SC, Cherry Point, NC, to name a few. Linda enjoyed helping out in the community; she liked gathering toys for “Toys for Tots” and helping out with PTA when the boys were in school. Linda’s hobbies included doing anything with the kids and grandkids. She enjoyed scrapbooking, baking Christmas cookies and loved researching family tree history. 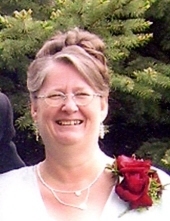 Linda is survived by her husband Dean; her sons: Mark (Tembre), Steven (Donna), Andrew (Aylisa) Roller; brothers: Rick, Dan, Martin (Brenda) and Raymond (Tammy) Reichert; six grandchildren; numerous nieces and nephews. She was preceded in death by her parents and other family members. A Vigil service will be 5:00 pm Sunday, January 27, 2019 and Funeral service 11:30 am, Monday, January 28th, both at Dahl Funeral Chapel. Interment will be in Yellowstone National Cemetery. Please join the family for a luncheon at Dahl’s after the burial. For full obituary and to leave memories visit www.dahlfuneralchapel.com. To send flowers or a remembrance gift to the family of Linda Marie Roller, please visit our Tribute Store. "Email Address" would like to share the life celebration of Linda Marie Roller. Click on the "link" to go to share a favorite memory or leave a condolence message for the family.